These cards are the same as the playing cards offered in the "Games" portion of the website -- except they are smaller. They are only 1" tall (originals are 3 3/4 inches) but contain all the detail of the full size cards. For reference I've included a quarter among the cards. 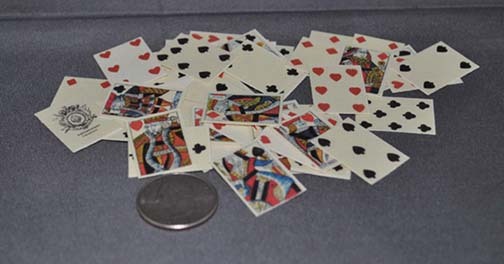 They are excellent for any of the card games your doll might wish to play or can be used for telling fortunes or for a variety of magic tricks involving cards. We have seen a list of doll accessories from 1865 that included playing cards. Unfortunately, they did not include a photograph of the cards in that reference. One of our cats decided to help me when I was taking the pictures. She brought me one of her favorite toys to include in the scene. Perhaps she is hoping Emily will get one of these for her cat and kittens? For more about Emily, on the website go to "The Travels of Civility" in the archived part of Virginia's Veranda. For more fun with Emily and other period dolls, visit the Facebook Group "Emily and Friends".